A monster dust storm approaches Stratford, Texas, on April 18, 1935, during the great Dust Bowl tragedy of the 1930s. We have recently experienced the dramatic results of a long term drought such as the one that occurred during the 1930’s dubbed “The Dust Bowl,” one in which recent talks in the media and with meteorologists refer to this current drought as the “Dust Bowl of 2012”. Therefore, the time associated with the events the above session is referring to is beginning now and will continue into the near future. 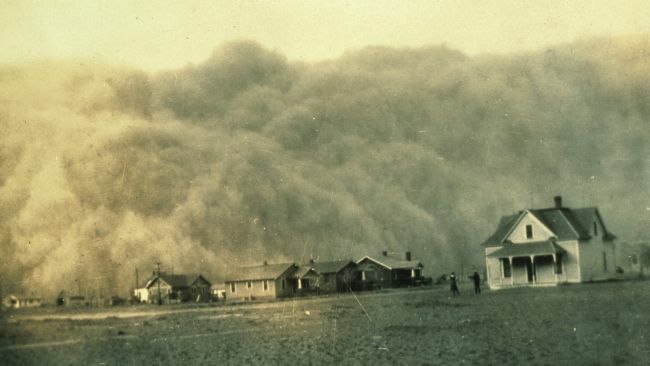 A dust storm approaching Beaver, OK during the Dust Bowl of the 1930s. An important note before I get into the details: Spirit is sharing this information with me because these efforts, as described below, are not meant for the good of the investigation, nor are they meant to find the truth. They are meant to deliberately distort the truth so nobody will be able to understand it. Why? That is a very good question, and an answer I’ve been given insight into. The why will be provided when the time is right, just as now the time is right for me to explain what spirit has been telling me all these years about what’s been going on. There are two undercover officers who are working on this/these case/s. Their “cover” has been blown and what spirit is telling me on this page along with the other pages that reference this/these particular person/s and events is that they are washing away their old identities and beginning a new set of identities. These undercover identities are associated with ONLINE SCREEN NAMES – and their undercover INTERNET IDENTITIES but they are also solidified with real life cover identities. Because of the deep cover and the complexities all around this situation, it took me a considerable amount of time to understand this completely but now I get it. This is it! They have MULTIPLE identities as well and I’m keyed in to those identities and where to find them as I’ve been provided with the new identities they will adopt once their cover is blown. Yes, I knew what their new undercover identities would be (their names, first and last, and even middle initials) before they even knew they’d need new ones. I also can prove this because, as is my detailed nature, I document and record everything important and relevant. I realized I was provided with their undercover identities a long time ago but knew I had to wait before I was able to publish this realization. The image above (page 8 of 01.11.09) indicates the timing associated with this change and why. I’ll not get into the why at this immediate moment but the change they told me, back in January 2009, would take place at the time of “The Dust Bowl Storms”. They indicated at that time that it would be in the “future” as described through the symbolism of being “off in the distance” but “coming their way”, and here we are right here and now. The sessions I did on 12.12.08 p2, and 12.13.08 (the entire session), along with hundreds of other references to these two throughout the past 5.5 years, tells me precisely who this person is and who “they” are. This is how I know they are police officers/agents/investigators. They are undercover as a married couple but it is all FAKE. He is nicknamed “Elvis” (I think in the real world) and she is on his “staff”. He is double undercover: an agent who is undercover as an officer who is undercover. Yeah, that was extremely difficult to figure out and made everything VERY confusing initially. 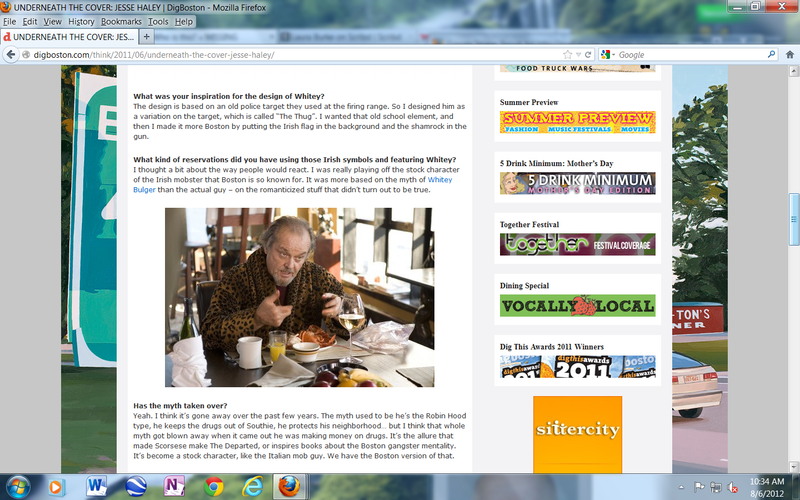 It is similar to the situation as portrayed in the movie “The Departed,” a movie I just saw this year for the first time. That movie was precisely like what I’ve been shown by spirit, it simply is a different setting (area/state). One of the key associations of that movie to what I see is that there are multiple undercovers and nobody knows who the other undercovers are! Oh, but there is so much more as I will detail in the weeks to come. Fascinatingly symbolic, was the “Whitey Bulger” connection (Session 10.08.09 p2) in The Departed. The mob boss character portrayed by “Jack” Nicholson in The Departed was based on and inspired by the real-life Boston mob boss, James “Whitey” Bulger. Notice in the image above where I ask “Who should I focus on?” This was FOUR years ago today, remarkably, but the message is still the same and has not changed since the beginning, (too bad nobody ever was interested enough in finding out the truth and took the time to ask me what this all means). In the image above, spirit shows me TWO people but together as one making up a Christmas wreath that was was a Jewish Star but it was also a “Badge“. A six pointed star badge made up of two triangles, one reversed and the other upright. They were both “jet” BLACK, and this is symbolic to the young woman who is “leaving on a jet plane” (it’s an identity wash, see Journal 3 02.18.09 p5 RE: Joan here: https://whereabouts67.wordpress.com/2009/06/14/lisa-stebic-02-18-09-8-pages/) and the “jet black” color shows the nature of the intent; extremely DARK. One was a female who had some medical issue with her toes. This person is also associated with another medical symbol, “Medical Monitoring” and the details on that will come at a later date as it is another issue tied to the same person. I know the real identity of the man, his true name and age, and I know what his relationship is with her therefore finding the truth will be a piece of cake. I also know the under cover umbrellas, i.e. ; he’s an undercover for ___ at ___ and is there acting as a detective undercover doing _______. He’s double undercover. This is the ultimate deception. He’s the bad egg and he is the one manipulating everyone. He has everyone believing in lies and running around in circles so nobody will find the truth because then he’d be in jail. He hates me and goes to great lengths to tarnish my reputation so no authority figure will ever consider what I have to say. He does this because he knows I see the truth and that scares the hell out of him. I have the “codes” to the “game” and the game is “Monopoly“. Monopoly is a Board game. See https://whereabouts67.wordpress.com/2009/07/26/lisa-stebic-08-13-08-08-25-08-2-pgs/ for the dream relating to the “Lead Guy” that was after me because I had the codes to the game. The codes are “The Ten Commandments“. They think they have the codes, but they don’t. The ones they have aren’t real. He is also beginning to sound like a broken record about me, or he already has. Either way, the truth will come out. I will be vindicated. We will find these missing persons because I now know where they are, and he’s the key, as is she, but mainly him because he’s the dirty one. She just believes him, or did. She’s beginning to wonder. This is also associated with the “1930s” symbol I received on November 8, 2008 p1, https://whereabouts67.wordpress.com/2009/06/17/lisa-stebic-11-06-08-11-08-08-6-pages/ . The Lighthouse mentioned on the 11.08.08 session on page 2 is the “7”. He is the double undercover. I will provide more on that when it is appropriate. The 1930s symbol relates to Alfonse “Scarface” Capone. This guy is “Scowlface” and he’s symbolic to James “Whitey” Bulger, the character played by “Jack“. Here is more on “Scowlface” as these two posts are looped together: https://whereabouts67.wordpress.com/2009/11/24/who-is-this/ . I will be back to explain more and provide further details later as I will be working on this aspect of the project for the next few weeks and months. There is a lot to explain here. The “This is it!” symbol, like all of spirit’s symbolism is multifaceted and another post is needed to explain all the facets associated with this particular symbol and how it links to everything else. Spirit never ceases to amaze me with their fascinating ability and incredibly complex and multifaceted way of communicating. The interwoven web of detailed associated meanings by spirit is awe inspiring. This entry was posted on August 4, 2012 at 10:33 AM and is filed under A lesson in Understanding Symbolism, Connolly, Elvis, FBI, INVOLVED Persons Described, ISP, j Connolly, James "Whitey" Bulger, John Oglesby, Journal 1, Journal 2, Lisa Stebic, Location of Remains Detailed Descriptions, Plainfield Police Dept., Scowlface, Stacy Peterson, This is it - Michael Jackson, Will County. You can follow any responses to this entry through the RSS 2.0 feed. You can leave a response, or trackback from your own site.